In 2009, nature protected areas, which include designated nature protected areas, Natura 2000 sites as well as areas that fulfil the conditions for Natura 2000 sites, covered 39.7% of the Slovenian territory, which is nearly six times as much as in 1992. 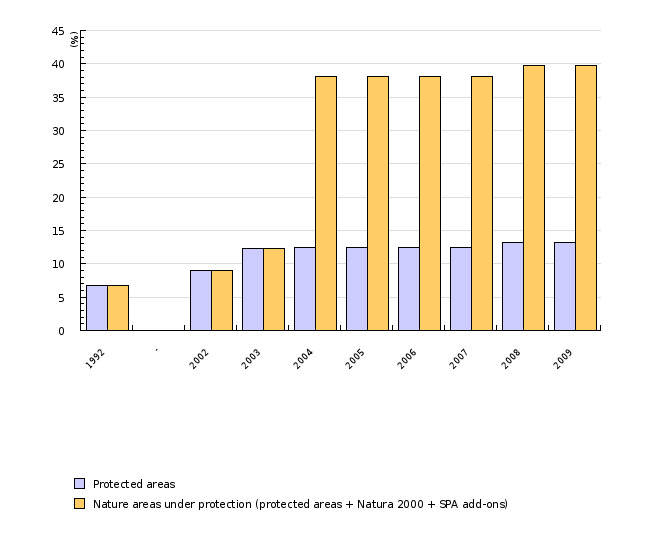 The surface area has increased mostly owing to Natura 2000 sites being designated in 2004, while in 2008 the increase was a consequence of the designation of those areas which, according to the European Commission, fulfil the conditions for Special Protected Areas, but had not been defined as Natura sites. Nature protection conditions must be met and/or nature protection consent must be given for any and all interventions in these areas. This indicator shows the surface area of nature areas under protection in Slovenia and their share in the total surface area of the country. Nature areas under protection include conservation areas – Natura 2000 sites and other areas that meet the same conditions as Natura 2000 sites – as well as protected areas of nature – that is parks, nature reserves and natural monuments. The indicator shows the surface area of areas under protection; it does not, however, provide direct information on how to achieve a favourable state of wild plant and animal species, their habitats and habitat types in these areas. 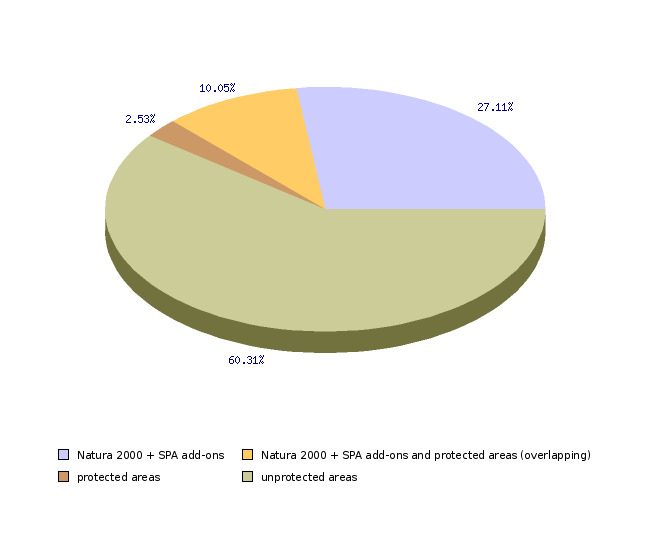 Protected areas partially overlap with Natura 2000 protection sites. They encompass a smaller surface area than the Natura 2000 sites; they are, however, organised at a higher level with management plans and appointed managing entities. Register of protected areas, Environmental Agency of the Republic of Slovenia, 2009. Register of protected areas, Register of Natura 2000 areas, Environmental Agency of the Republic of Slovenia, 2009. The Resolution on the National Environmental Protection Programme 2005–2012 (Official gazette of the RS, No. 2/06) aims for the share of protected areas to be increased by 5%. The original goal for Natura 2000 was the adoption of an operational programme, which was adopted by the Government of the Republic of Slovenia in October 2007 (Natura 2000 Site Management Programme 2007–2013). The Programme's protection goals are to be met by implementing protection measures that are essential for the preservation of a favourable state of animal and plant species as well as habitat types. Meeting both goals would lead to the attainment of the essential nature conservation goal, which was the reason why protected areas were established in the first place: to halt biodiversity decline by 2010. Until 2004, the physical space of specific significance in Slovenia was protected within the framework of nature areas under protection (national parks, regional parks, landscape parks, strict nature reserves, nature reserves and natural monuments). Roughly 12% of the entire territory of the Republic of Slovenia was protected within this framework in 2005, which has not changed significantly until today. Triglav National Park represents an important share of these areas, while in recent years, protected areas have increased, mostly due to the proclamation of three larger parks (the Notranjska Regional Park, the Goričko Landscape Park and the Ljubljansko barje Landscape Park). Natura 2000 sites joined the protected areas in 2004. These areas include almost 7,203 km2 or 35.5% of the entire Slovenian territory. Areas that meet the conditions for Natura 2000 sites, covering 340 km2 or 1.7% of the country, were further designated in 2008. Protected areas partly overlap with Natura 2000 areas and other areas that meet the same conditions as Natura 2000 sites. In 2009, these areas combined represented 39.7% of the Slovenian territory, which is six times as much as in 1992. The data relevant to the indicator for previous years were modified in 2009 so as to review and correct some errors in the Register of protected areas and to eliminate technical errors from previous years. In Slovenia, the share of Natura 2000 areas is large in comparison to other European countries. Slovenia protects a share of its territory 2.5 times larger than in the EU-27, both according to the Directive on the conservation of natural habitats of wild flora and fauna, as well as the Directive on the conservation of wild birds. A large portion of the protected areas arises from a the environmentally friendly use of physical space, which is reflected in extensive forest cover and a high ratio of grassland in the structure of agricultural land. Considerable surface areas of partly overgrown or barren land above the tree line also contribute to a large share of protected areas. Data on protected areas is managed in the database Register of protected areas by the Environmental Agency of the Republic of Slovenia, the Nature Conservation Sector, on the basis of Article 111 of the Nature Conservation Act (NCA-OCT2, Official Gazette of the Republic of Slovenia, No. 96/04), and Article 105 of the Environmental Protection Act (EPA-1-OCT1, Official Gazette of the Republic of Slovenia, No. 39/06). Data on Natura 2000 areas is managed in the database Register of Natura 2000 areas in the realm of registers of those areas that are significant for maintaining biodiversity, by the Environmental Agency of the Republic of Slovenia, the Nature Conservation Section, on the basis of Article 34 of the Nature Conservation Act (NCA-OCT2, Official Gazette of the Republic of Slovenia, No. 96/04), and Article 5 of the Decree on special protection areas (Natura 2000 areas) (Official Gazette of the Republic of Slovenia, No. 49/04, 110/04, 59/07 and 43/08). Since the same landscape may be included both in protected as well as conservation areas, the datum on net surface areas has been applied for calculating the ratio of various protection types, overlapping areas and unprotected areas (without duplicating the surface areas that are simultaneously included in various protected areas).